These blizzards are great as an afternoon treat. Try keeping the ingredients in the freezer for quick preparation. 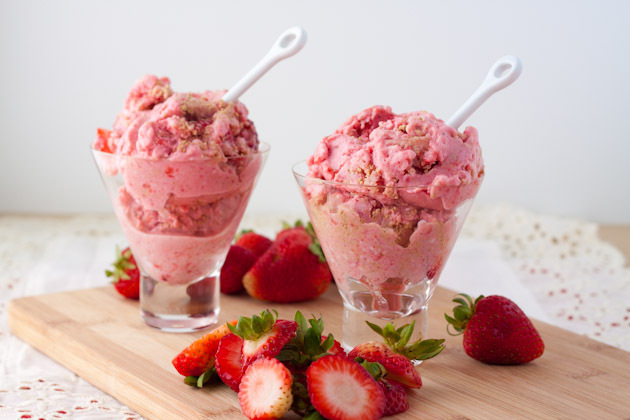 Place coconut milk cubes, frozen strawberries, lemon juice, vinegar, and vanilla in your food processor. Pulse with the “S” blade until mixture is broken up. It should look like pieces of hail in the bowl. This process takes about 30 seconds of pulsing on and off. Continuing to pulse, add non-dairy milk slowly. Use up to 1 cup. Discontinue when mixture forms a ball. Remove ice cream ball from processor and place in a large bowl. 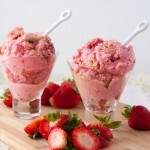 Mix in fresh strawberries and graham cracker crumbs. add honey or coconut sugar if you don’t like the slight tartness. I loved it!